In Visit to Hades, an analysis of the extermination camps as a form of productive labor, Anders notes historically overlapping modes of obliteration. 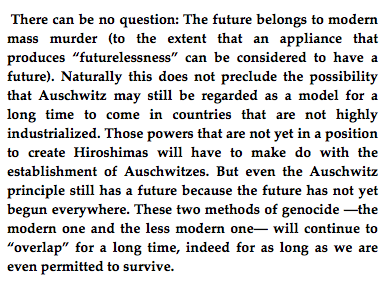 One way or another, the future belongs to mass murder. Since the age of the Inverted Utopian is far from over, Anders’ philosophy of discrepancy remains strikingly relevant. We continue to devise tools, techniques and networked systems, with ethical and ecological implications that we are unable to fathom, whether in neurobiology, financial algorithms or energy extraction. Anders would likely be surprised that the species is still around in the year 2013. And surely he could not have imagined that there would eventually exist such an occult ecstasy within the lethal discrepancy, namely among those infatuated with the coming (yearned for) “singularity” between human bodies and artificial intelligence. In fulfillment of the inverted utopian maxim, a world without us will be such a crowning achievement for the species; let’s be sure not to leave any loose ends.